We have some of the best German Shepherds southern Colorado has to offer! Welcome to Von Rief German Shepherds! We are located in beautiful Elbert, Colorado about 15 minutes east of the Black Forest area. At Von Rief German Shepherds, we strive to combine excellent temperaments with world class bloodlines to produce the all-around family protection companion. Our goal is to maintain the German Shepherd breed standard by bringing together the highest quality of show and working lines direct from Germany. All of our German Shepherds puppies come with a three year health guarantee and all of our dogs used for breeding have their hips and elbows certified. My love for the German Shepherd dog started when I was very young. I purchased my first German Shepherd at the age of fifteen and although I already admired the breed, my love and respect continued to grow as I realized what the German Shepherd dog was all about. After owning my first German Shepherd, I decided that someday, I would like to be a part of promoting this awesome animal and become a breeder myself. This magnificent dog is known for its beauty, loyalty, athletic ability and its desire and love to work. The German Shepherd excels at the sport of Schutzhund and is also well known for military and police work. More importantly, the German Shepherd is recognized for its loyalty and dedication to his or her family. He is a natural protector, he loves children and is a faithful companion. Make and appointment and come visit our German Shepherd Elbert (15 minutes east of Colorado Springs) kennel location and pick out a puppy that is right for you. Our puppies come with a three year health guarantee, AKC registration papers (full registration), microchip and puppy vaccines. If you are not located in Colorado, we can ship your puppy for you. We are familiar with the requirements for shipping to other countries including health documentation and kennel requirements. We ship our German Shepherds on a regular basis throughout the United States, Canada and Mexico. We also ship worldwide to countries including Germany, England, Japan, Australia, Brazil, Chile, United Kingdom and Belgium to name a few. 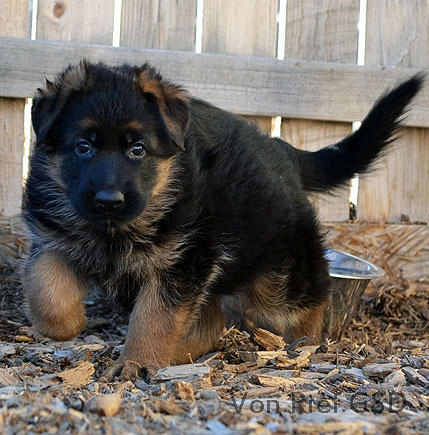 Come visit Von Rief German Shepherds for the finest German Shepherds Colorado Springs has and share in our passion for the outstanding German Shepherd dog. Whether you are looking for a German Shepherd for breeding, showing or for your family protector and companion, Von Rief German Shepherds has the right dog for you!